Not a stream - this is, in fact, the frozen trailhead leading up the side of Noon Hill. 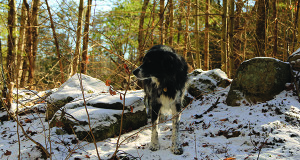 Millie, who lives on Rocky Lane, blends nicely into the terrain of Noon Hill. Noon Hill shoots out of the woods of Medfield like a pair of hands reaching for twelve o’clock. Though the hill is visible from all around, it takes a bit of searching to find the dirt parking lot. 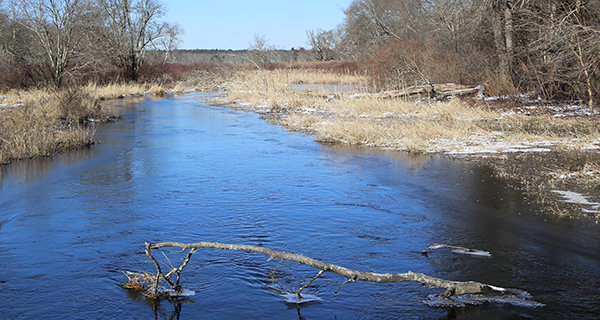 South Street drops down from Route 27, then a sudden right on Noon Hill Road will take you across the wetlands of Stop River and deposit you at the base of the 370-foot hill. From there, the only place to go is up. There are two routes to the top of Noon Hill, and the path you don’t take will simply be the end of the path that you do take, so don’t worry about missing out. What looks like a frozen stream off to the left is, in fact, the wider trailhead. By winter, the melt and rainwater rushing down from the summit chooses this trail as the path of least resistance, where it freezes wide and solid, like a tiny glacier creeping down a miniature mountain. It’s all woods out here - there’s not a house in sight, and aside from the tall trees, the largest solid objects visible are the Volkswagen-sized boulders that line the path and peer heavily through the trees. The snow on the ground is pocked with equal parts dog-prints, boot-prints, skittish bird-prints, and a medley of hoof and clawed-paw prints. If dressed for the cold like a true New Englander, the steepening hill face and the climbing altitude may cause those layers of Norwegian sweaters and down jackets to pull a bit tight on the skin. But just as you’re about to unzip and drop a layer, the path stops. 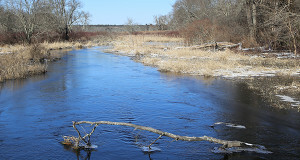 The Stop River, clear and cold in the winter, welcomes visitors to the park. At the top of Noon Hill, the woods drop away and roll out into the countryside, relieving the heat and tension of the sweaters in which you’ve swaddled yourself against the cold. The wind cuts across the peak, kicking up swirls of snow and causing the tall trees to sway and groan with a timber snore. It’s a cold and slippery hike up to the top, but there’s no better way to forget about the woes of winter than to dive headfirst into it and up Noon Hill.